As if stand-alone technologies weren’t advancing fast enough, we’re in age where we must study the intersection points of these technologies. How is what’s happening in robotics influenced by what’s happening in 3D printing? What could be made possible by applying the latest advances in quantum computing to nanotechnology? Along these lines, one crucial tech intersection is that of artificial intelligenceand genomics. Each field is seeing constant progress, but Jamie Metzl believes it’s their convergence that will really push us into uncharted territory, beyond even what we’ve imagined in science fiction. “There’s going to be this push and pull, this competition between the reality of our biology with its built-in limitations and the scope of our aspirations,” he said. Metzl is a senior fellow at the Atlantic Council and author of the upcoming book Hacking Darwin: Genetic Engineering and the Future of Humanity. 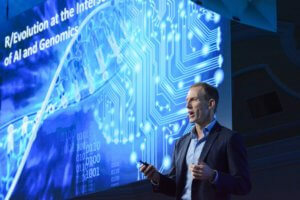 At Singularity University’s Exponential Medicine conference last week, he shared his insights on genomics and AI, and where their convergence could take us. Metzl explained how genomics as a field evolved slowly—and then quickly. In 1953, James Watson and Francis Crick identified the double helix structure of DNA, and realized that the order of the base pairs held a treasure trove of genetic information. There was such a thing as a book of life, and we’d found it. In 2003, when the Human Genome Project was completed (after 13 years and $2.7 billion), we learned the order of the genome’s 3 billion base pairs, and the location of specific genes on our chromosomes. Not only did a book of life exist, we figured out how to read it. Fifteen years after that, it’s 2018 and precision gene editing in plants, animals, and humans is changing everything, and quickly pushing us into an entirely new frontier. Forget reading the book of life—we’re now learning how to write it. In 2016, DeepMind’s AlphaGo program outsmarted the world’s top Go player. In 2017 AlphaGo Zero was created: unlike AlphaGo, AlphaGo Zero wasn’t trained using previous human games of Go, but was simply given the rules of Go—and in four days it defeated the AlphaGo program. Our own biology is, of course, vastly more complex than the game of Go, and that, Metzl said, is our starting point. “The system of our own biology that we are trying to understand is massively, but very importantly not infinitely, complex,” he added. Getting a standardized set of rules for our biology—and, eventually, maybe even outsmarting our biology—will require genomic data. Lots of it. Multiple countries already starting to produce this data. The UK’s National Health Service recently announced a plan to sequence the genomes of five million Britons over the next five years. In the US the All of Us Research Program will sequence a million Americans. China is the most aggressive in sequencing its population, with a goal of sequencing half of all newborns by 2020. “We’re going to get these massive pools of sequenced genomic data,” Metzl said. “The real gold will come from comparing people’s sequenced genomes to their electronic health records, and ultimately their life records.” Getting people comfortable with allowing open access to their data will be another matter; Metzl mentioned that Luna DNA and others have strategies to help people get comfortable with giving consent to their private information. But this is where China’s lack of privacy protection could end up being a significant advantage. To compare genotypes and phenotypes at scale—first millions, then hundreds of millions, then eventually billions, Metzl said—we’re going to need AI and big data analytic tools, and algorithms far beyond what we have now. These tools will let us move from precision medicine to predictive medicine, knowing precisely when and where different diseases are going to occur and shutting them down before they start. In Metzl’s mind, the most serious application of our genomic knowledge will be in embryo selection. Currently, in-vitro fertilization (IVF) procedures can extract around 15 eggs, fertilize them, then do pre-implantation genetic testing; right now what’s knowable is single-gene mutation diseases and simple traits like hair color and eye color. As we get to the millions and then billions of people with sequences, we’ll have information about how these genetics work, and we’re going to be able to make much more informed choices,” Metzl said. Imagine going to a fertility clinic in 2023. You give a skin graft or a blood sample, and using in-vitro gametogenesis (IVG)—infertility be damned—your skin or blood cells are induced to become eggs or sperm, which are then combined to create embryos. The dozens or hundreds of embryos created from artificial gametes each have a few cells extracted from them, and these cells are sequenced. The sequences will tell you the likelihood of specific traits and disease states were that embryo to be implanted and taken to full term. “With really anything that has a genetic foundation, we’ll be able to predict with increasing levels of accuracy how that potential child will be realized as a human being,” Metzl said. It’s a slippery slope from gene editing and embryo-mating to a dystopian race to build the most perfect humans possible. If somebody’s investing so much time and energy in selecting their embryo, Metzl asked, how will they think about the mating choices of their children? IVG could quickly leave the realm of healthcare and enter that of evolution. “We all need to be part of an inclusive, integrated, global dialogue on the future of our species,” Metzl said. “Healthcare professionals are essential nodes in this.” Not least among this dialogue should be the question of access to tech like IVG; are there steps we can take to keep it from becoming a tool for a wealthy minority, and thereby perpetuating inequality and further polarizing societies? As Pontin points out, at its inception 40 years ago IVF also sparked fear, confusion, and resistance—and now it’s as normal and common as could be, with millions of healthy babies conceived using the technology.